Many DJs start out as people who love music and entertaining. This hobby can quickly grow into a business that provides a source of income for what you do best. Helping you protect your business is what we do best. Protection for someone slipping and falling over your electrical cords while playing an event. Protection for errors that you make in the course of doing business that cause financial loss to others. For example, you incorrectly schedule to perform at a birthday party on Saturday when the event is on Friday and you are double booked. 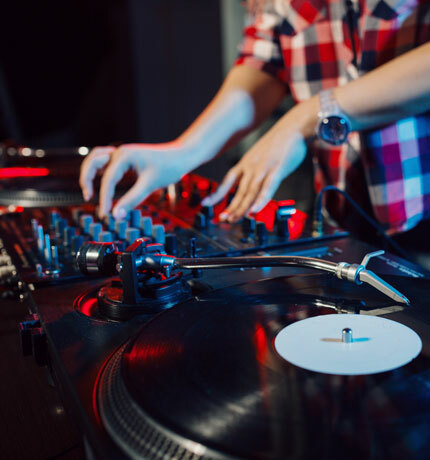 Professional liability would provide coverage for any extra expense that the host incurs in finding a new DJ at the last minute. Protection for the lost income due to your home being uninhabitable. For example, you typically meet with clients at your home, but, due to a fire, you need to rent temporary office space on a part-time basis. The extra expense incurred due to the fire would be covered. Protect your equipment - DJ equipment is stolen often and is expensive to replace. Transport your equipment securely and store it in a safe place when it is not in use. Keep the area around your booth clear - Wires and cables can present trip and fall hazards. Be sure that cables are stowed out of reach. Placing a barrier around your booth can ensure that party-goers are at a safe distance. Be aware of your volume - Loud music can cause hearing damage. Be aware of the acceptable levels on any amplifiers that are being utilized. Avoid throwing - Not everyone in your audience can catch or is paying attention so avoid throwing giveaways into the crowd.